Here are 3 practical steps on how we can move forward when faced with uncertainty. Don’t get frozen by what you don’t know, stick and commit to what you do know. While waiting for things to be clearer, take it one day/thing at a time. There may be a need to take some time off to figure things out, but otherwise don’t put everything on hold (or drop everything) simply because you cannot see how your today connects to your tomorrow. When God called Abram (later renamed Abraham), He simply said to “go to the land that I will show you” - this command also came with a promise that He will be blessed abundantly (Genesis 12:1-3). That is as vague as vague can be! If it were me, I would be asking all kinds of questions: “Where are we going?” “How far is the journey?” “How long will it take?” “How will I know I am going the right way?” “What will my blessing look like?” “Is that really you, God?” Yet, Abram dutifully obeyed and took all that he had and went on his way (Genesis 12:4-5). He went with what he knew to do. Next, he arrived in Canaan and had a revelation from God that he would inherit this land. BUT, it was occupied by the Canaanites. What did he do? He went with what he knew. He worshipped the Lord, but kept going (Genesis 12:6-9). Then, a famine hit the region of Canaan - what did Abram do? He went with what he knew to do - he went to Egypt to escape the famine (Genesis 12:10). Abram faced many uncertainties and challenges throughout his journey, yet he took it step by step. He went with what he knew at the point he was in. How does that translate practically into our lives? Just completed high school but you don’t know what to pursue? Go do an internship or a foundation course in college. Want to be a politician but don’t know where to start? Join a political party and volunteer. Stuck in your career and at a lost of what to do? While figuring out your next job, remain faithful and reliable at your current one. Have an idea but don’t know how to proceed on it? Seek out people with experience in those areas and talk to them: learn, glean, absorb - be humble and hungry. Feeling like you are called to another ministry but unsure of which one? Continue serving passionately and honour those above and around you, make a move when things are clearer. The key is to take things one step at a time. God may give us a “big picture” of things, but He quite often leaves out the “tiny details”. I believe this is intentional - because if He show and tell us everything we would need to know, we would stop relying on Him and start to believe we can be independent of God. Life is quite often like a puzzle. You have the picture in mind, but the pieces at hand. It is easy to feel overwhelmed by all the pieces and not know where to start, but as you begin to pick up one piece, and connect it to another, and another piece connecting to another - little by little things will start to come into perspective. Don’t be paralysed with fear, but be mobilised by faith. Remember, go with what you know and WHO you know. The author and perfecter of our journey is Jesus. Many a times, the following step is only made clear by taking the preceding one - like turning a bend to see what is around the corner. A ship is safe in harbour but that is not what ships are made for. You were made for so much more - don’t only realise that when the chances are less. “What if I take a wrong step? What if I make an incorrect choice?” Trust me, the power of choice is ours but I’m fairly certain that it isn’t potent enough to undo or derail the plan of God. Don’t give yourself that much credit. If you find yourself heading in the wrong direction, it is always possible to have a course correction - that’s the grace of God. Here is what I am convinced of: it is better to look back and be able to say: “At least I’ve tried” then to live with the regret of “If only I did.” Take the next step, Jesus has the wheel.  The Lord directs the steps of the godly. It is said that the fear of failure is actually more detrimental than failure itself. Because failure is common and almost necessary in life. Failures cause us to learn, and learning causes to grow, and growing pushes us closer to the destiny that God has in store for us. If you ever find yourself in a situation where you have failed, don’t look at it as setback but rather a setup for a comeback - in victory we celebrate, in defeat we evaluate. God wastes no experience so nor should we: learn from it. Failure is not the opposite of success, it is part of it. Don’t fear failure, embrace it. Failure is an event, it is never a person. Failure can either defeat us or define us - it is not about how you fell down, it is about whether you are willing to get back up again. Only when we refuse to learn or pick ourselves up again can it be said to be final. So go on. Make a move. Take the next step, don’t fear failure and whatever you do - keep on keeping on. It's OK To Be Unsure Of What To Do. Uncertainty, it comes in all shapes and sizes. Some are minuscule: “What should I eat?”, “Should I buy that?”, “Will that place be nice?”. Others are substantial: “What course should I take?”, “Do I go or stay?”, “Who should I marry?”, “Will it ever be ok?”. The minor ones are vexing at the most, the major ones can be paralysing at its worst. Life is full of uncertainties, it cannot be avoided. We often find ourselves placed in the crossroads of different options to take - and it is all very confusing and frightening. We are afraid to choose wrongly, we are confused by the variety, we are frustrated that we have to choose … it is safe to conclude that the only thing that we can be certain of is that almost nothing is certain. Of course, this goes against our primal instinct as human beings. We hate uncertainty. Why? Because to a certain extent we all want to be fully in control. You can only be in control when you are certain. Like driving a car: you are in control because you know how the car works (generally) and you know where you want to go and you know the way to get there. If only life is that straightforward: I know what I should be doing, where I should be going, when things will happen, how it will all turn out and who will be there along the way. But it isn’t. In my last piece, I mentioned Genesis 32:22-31 and the defining phrase of the story: “I will not let you go unless you bless me (Genesis 32:26) as well as the intriguing response of the Divine: “You have wrestled with both God and men and won (Genesis 32:28)” The part about wrestling with men - perhaps sometimes our biggest opponent is not necessarily other people but ourselves. The original meaning of the translated Hebrew word here simply means “(a) mortal person”, us included. Our struggle with ourselves is not just in the area of wanting to do good and not being able to, but also knowing that we shouldn’t be so obsessed about being in control over everything and yet we can’t help ourselves. The problem is: we are limited. There is only so much we know, and there is only so much we can do. We can’t predict or see beyond … hence the uncertainty. Yet, with God this is actually a perfect position to be in. Hebrews 11:6 reminds us that without faith it is not possible to please God and also promises a reward to those who fully trust Him. Get this: uncertainty creates the necessity for faith, and faith is a pathway to blessing. Without uncertainty, there will be no need for faith and hence no opportunity for blessing. I am convinced that God leaves a gaps in our lives that fuel uncertainty because it would only mean an increase dependability on Him. Let’s be honest, the times when we forget God the most are the times where things are clear and going well - and the times we are often closest to Him are when we are at an absolute lost of what to do. Our faith is not blind nor futile - in fact it is built on the only thing that is certain - Jesus. He is never changing and ever faithful. He is the one we ought to relinquish control to. We may think we know better, but God always knows the best. Therein lies the key to true peace and blessing: to be contented to be caught between Who we know and what we cannot yet see. To be comfortably uncomfortable in the intermedium of who God is and what He says He will do. The struggle/wrestle of holding on tightly to the force driving us forward even though our strength is waning and we are tempted to just let go. If you are faced with many uncertainties today, good news: you are exactly where you need to be - in God’s safe hands. Let him have the wheel. Allow him to take control. You on the other hand: sit back and enjoy the ride - as well as the presence of the One who is taking you on this journey. While you are on that journey of discovery, ask the tough questions; wrestle with the issues; press into prayer. You will find what you are looking for. But once you get there you will realise you haven’t quite arrived. There will be more destinations to go to, more questions to be answered. Just remember: It is OK - and keep on going. Recently, God has been stirring something in my spirit. Something that the Holy Spirit spoke to me personally, and I hope that this encourages you as well. “If it is meant to be, God will make it happen anyway.” How often do we think this to ourselves, whether consciously or sub-consciously. We rarely want to toil in prayer, or push for a breakthrough or endure heartbreak and hardship for what we are believing to get because a part of us is resigned to the fact that perhaps if it’s God’s will then it will happen and if it isn’t then there is no point. However, as I have been seeking God through prayer and scripture, another perspective comes to mind. In Genesis 32:22-31, there is the story of Jacob wrestling with what seems like an angel, but later on revealed to be God Himself. Jacob wrestles to the point of having his hip dislocated, but in the midst of such a dire scenario he exclaims: “I WILL NOT LET YOU GO UNTIL YOU BLESS ME.” Now Jacob’s life up to this point to say the very least, was far from smooth: His name literally means “deceiver” (he was born grasping the heel of his twin brother Esau), he tricked and took advantage of his brother Esau TWICE, he laboured for 7 years for Laban to marry one of his daughters but at the end of it managed to MARRY THE WRONG DAUGHTER and laboured 7 years more to get the right one (Laban only had 2 daughters, so thankfully another mistake was improbable) and in the end got into Laban’s bad books as well because he tried to trick him. 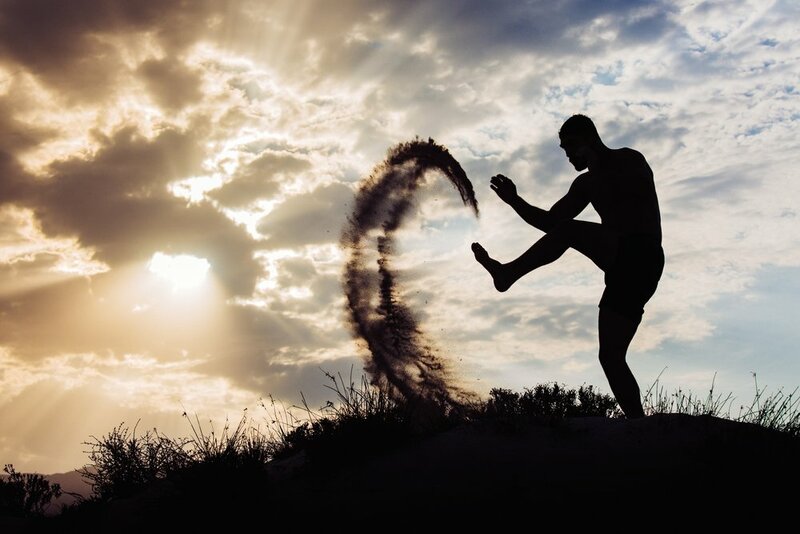 A colourful and eventful past, yet Jacob found himself in wrestling with the angel of God. Upon proclaiming that audacious line, the reply Jacob received from God was: “…. you have fought with both God and men and have won.” Other versions use the word “prevailed.” That line struck me. Here was Jacob, a broken, imperfect, scheming man - yet he fought with God and won? It’s plain, it’s simple, it’s spelt out to us - but why do we not pray like this? I think we forget that the God we are asking from is unlike any other. This is the God that invites us to ask audaciously, to dream big, to demand for more - because He has already given us His best, He will not withhold anything less from us. Where did I get that from? A normal person will chide us for dare asking for more after they have gone above and beyond for us - but our God is no regular joe. Ask first, determine later. Let God do the deciding on what should or should not be, you just ask for what you need and what you know He has placed in your heart. Ask for your healing, ask for your breakthrough, ask for your promotion, ask for His favour, ask for His deliverance, ask for His provision, ask for His clarity, ask for His peace - just ask! Don’t work it out in your mind on whether He will reply or if it His will - remember: ask first, determine later. The worse that could happen is you just get a no - even then rejection from God is redirection by Him to something better. Make no mistake about it, all of this is going to be a fight - it is always a fight to do the right thing. To live by faith and not feelings. To go by conviction and not convenience. To honour God instead of indulging ourselves. In Genesis 32:28, just as Jacob was proclaimed to have wrestled with both God and man, he also had a name change - from Jacob to Israel. His identity went from “deceiver” to “God prevails.” A fight for your blessing will not leave you the same - it will shape you significantly. You will know what you are truly made of, and you will know who God truly is. Jacob may have ended up with a limp, but he was still standing. He no longer had his own support, but he had come face to face with God. In our fight for our blessing, we will lose certain things - but what we stand to gain is far greater than what we could possibly lose out on. If you're wondering how did it happen, it's not much of a story really. 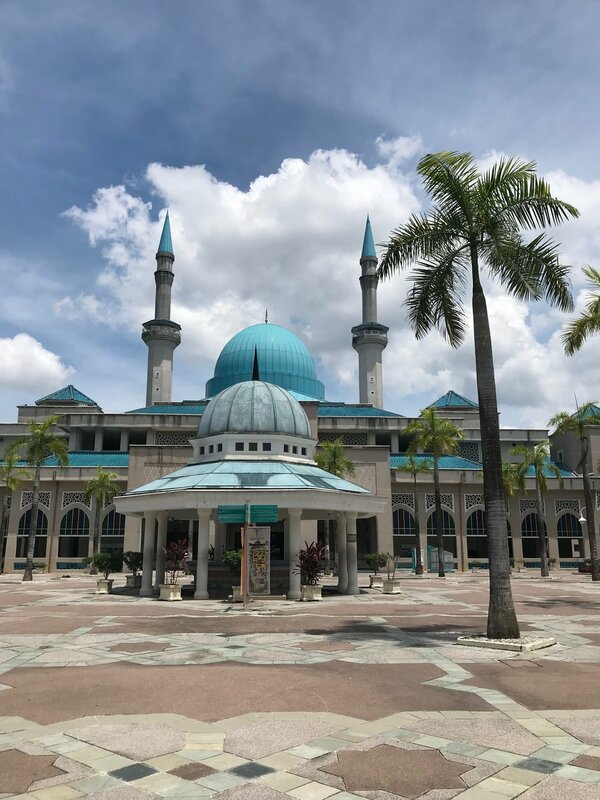 We've been having a little course called the "Young Pastors' Academy" (YPA) at my church and we got an opportunity to visit the International Islamic University of Malaysia via a contact of the person in charge of the YPA program. What I learnt from the trip though, is something worth telling. The biggest thing the trip did was break misconceptions. The first thing that I was proven wrong on was the nature of the institution itself. I had in mind that this would be a seminary or Bible college equivalent, but it is a full fledge university with programs in Engineering, Medicine, Computer Science as well as Theology/Divinity. The facilities were fairly up to date and well maintained, and there were a host of nationalities represented amongst the student ranks. I didn't just meet and see Malay Malaysians, but people from China, Yemen, Syria, Iran etc. I will be honest, when I came to the university I thought I would find a place riddled with conservatives (and even fundamentalists) but instead I discovered the students and lecturers here were not only progressive in their thinking, but warm and friendly people as well. (I regret my ignorance!) Everywhere I walked I wasn't met with suspicious looks but greeted with friendly nods and smiles. I saw flyers on Interfaith Dialogues pinned to walls, a lawn occupied by students running a International/Intercultural event and a cafe playing RnB music. Things became even more enlightening when I got the opportunity to attend one of the classes by the hosting lecturer. Both the YPA contingent and the students took turns introducing ourselves. When it came to my turn, I boldly declared "My name is Jon, from SIBKL - and we come in peace." This was on a dare by my colleagues who were lacking courage - and of course a joke. My little wisecrack was met with a fitting reply by our host: "And you will not leave in pieces." The ensuing chuckles all across the room set the tone for a friendly get-to-know-you-session. We asked questions of each other. Questions ranging from religion to politics. We clarified that when Christians prayed "Let Your kingdom come" we do not mean a literal takeover by Jesus or Christians over the physical government - why one would without any biblical knowledge would think that is understandable. We explained what pastors do, they told us how Mosques operate in Malaysia. We asked them what their political stance was, they said they were against corruption and oppression. We enquired about their hopes; they told us they wanted equality for all - the freedom to express one's religion no matter what that is. While it has been portrayed that there are many things that separate us, what I saw and felt was a great desire to build bridges and tear down walls. We have more in common that we are led to believe. We didn't compare our differences, we looked for our similarities. We hold to different faiths, but we have the same belief - we are not just Chinese, Indian, Malay, Muslim, Christian, Hindu - we are Malaysians. On that, we should stand united. Our visit concluded with a meal with our host lecturer as well as an academic dean (who was a former politician with the current ruling party). Our conversations reinforced what I have come to know is true - change is not just possible, it is already here. We talked openly about what has been going wrong in our nation and agreed for the future of our children certain things need to be done ... and mindsets have to be changed. At this time of writing, the 14th General Election of Malaysia is a mere 17 days away. Sentiments and emotions are high, and many are desperate for a change. There is almost a certain sense of "it is now or never for Malaysia". Leading up to my visit here, I found myself caught in this wave of thinking too. Yet, God does indeed work in mysterious ways. It was in the place of a different faith that the Holy Spirit spoke gently to me: "regardless of what happens on Election Day, there is hope." 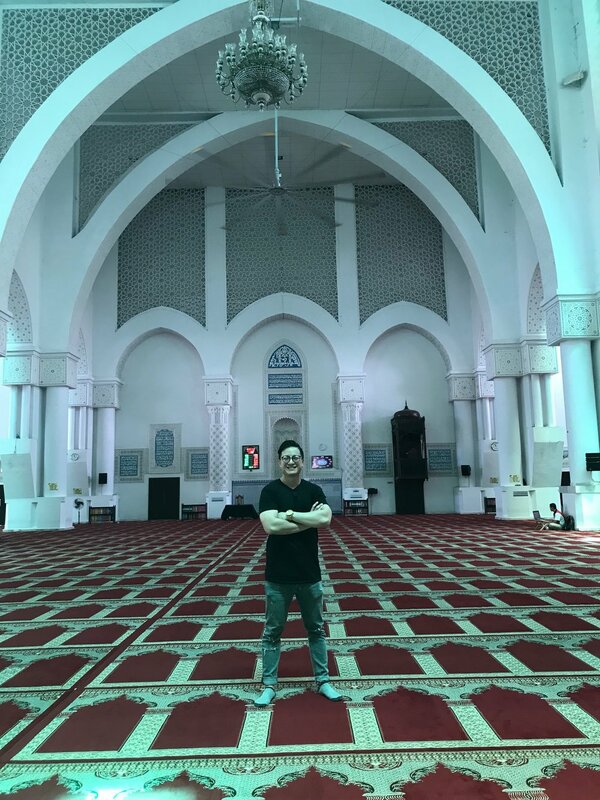 I stand in the hall of a Mosque that has a capacity of 9000, and I wonder what is the capacity of our hearts? Can we reach out, understand each other and establish relationship? It is easy to judge something and someone we do not fully know, but assumptions and misconceptions can only be dispelled through an understanding formed through relationship. Is not just about what happens on Election Day, but rather what happens after. The future, contrary to popular belief, is not only in the hands of the government - but ours. What will we do with people are who are different than us but living in the same country? What will we speak of them? To our children, to our congregation, to our students, to our communities? Let us continue building bridges and tear down walls - for a better Malaysia.